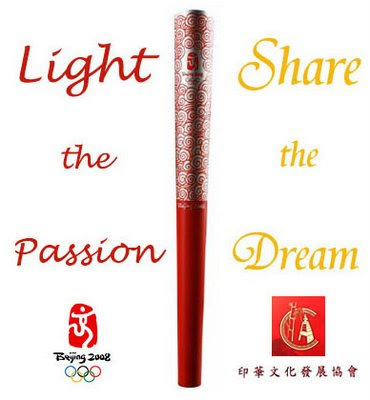 The commencement of Beijing Olympics on 08.08.2008 at eight minutes past 8 o'clock in the evening will guarantee that it will be carried out under the most auspicious circumstances, as the digit "eight" is considered synonymous with "prosperity" , "fortune" or "wealth" . Let us pray that the "lucky" day will lead a hassle-free event, amid concerns of bad weather in the host city.Lets rain not disrupt the opening ceremony from 8:08 pm to 11:30 pm at the open - air national stadium ("Bird's Nest") ,though 32,000 strong team has been mobilised with scientific - engineering backgrounds and cloud - seeding technology to drive clouds away on the D-day. Wish Sports be at the service of the harmonious development of man, with a view to promoting a peaceful society concerned with the preservation of human dignity. 'Harmony' boasts strong Chinese characteristics, and expresses the traditional Chinese philosophy in pursuit of a balance between man and nature, among people and between man's body and soul. Let us build a harmonious society of enduring peace and common prosperity.